ALBANY, N.Y. - All 23 of Napheesa Collier’s career double-doubles with the UConn women’s basketball team have come by the combination of points and rebounds. The number of double-doubles would be 24 to match her Huskies’ uniform, and her first with points and assists, if not for a mistake by the stat crew at Gampel Pavilion during last Saturday’s NCAA Tournament first-round game with Saint Francis of Pennsylvania. In the opening minute of the third quarter, Collier passed the ball out to Katie Lou Samuelson, who connected on a 3-pointer. Gabby Williams, however, was credited with the assist. Collier would finish the game with 25 points and a career-high nine assists, three assists better than her previous best. Her coaches and teammates care, though. Her coaches care because it’s a sign of how Collier has expanded her game, and it allows the Huskies to play their unselfish style. Her teammates care because they are the beneficiaries of Collier’s passes and she helps makes them better players. Heading into Saturday’s NCAA Albany Regional semifinal game with No. 5 Duke at the Times Union Center, Collier has 115 assists in top-seeded UConn’s 34 games. She totaled 117 assists in 75 games over her first two seasons. UConn (34-0) leads the country in scoring offense (89.8 points), field-goal percentage (53.5), assists per game (22.9), and assist-to-turnover ratio (1.86). The Huskies’ assist leader, Williams, is 43rd nationally. Crystal Dangerfield barely breaks into the top 150 at No. 149, while Samuelson is at 179th and Collier is just outside the top 250. “The worst thing that can happen is to have a really good player on our team standing wide open and you don’t pass them the ball or you can’t get them the ball or you throw a lousy pass to them,” UConn coach Geno Auriemma said. “Because then what is the point of having a bunch of good players if you have a bunch of guys who can’t pass? Then you become a selfish team. For the second straight season, Collier finds herself among the leaders in numerous categories in the American Athletic Conference. The St. Charles, Missouri, resident is in the top 15 in scoring (10th at 15.9 points), rebounds (ninth at 7.4), field-goal percentage (fifth at 58.2), free-throw percentage (eighth at 80.4), steals (12th at 1.7), and blocked shots (third at 1.8). But this season she is also 13th in assists at 3.4 per game and fourth in assist-to-turnover ratio at 2.2. “It’s important to be able to make good passes, especially on a team like this where everyone can score and you can get them the ball in places where they’re comfortable,” Collier said. “It’s something that the coaches have talked about and emphasized in my years here. Collier put together perhaps her best back-to-back games of the season in the Storrs sub-regional. In wins over Saint Francis and Quinnipiac, she averaged 24.0 points on 83.3 percent shooting from the floor, 6.5 rebounds, and 6.5 assists. 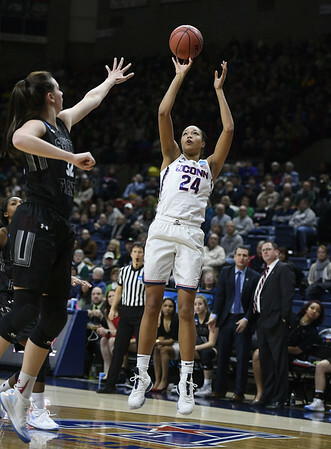 “She just dominated down low, but she was also able to mix it up going outside and making jump shots as well as passing the ball,” UConn forward Azura Stevens said. “She’s been really doing it all. But for much of her junior year she has been trying to live up to her own high expectations and comparisons to her magical sophomore year, one of the best in Huskies’ history. She was a consensus first-team All-American after averaging 20.4 points on 67.8 percent shooting and 9.1 rebounds. After being one of five UConn players - Samuelson, Stevens, Williams, and Kia Nurse are the others - to be named to the WBCA Region 3 team, Collier is a finalist for the 2018 WBCA All-America team. Whether she is chosen to that 10-player squad remains to be seen. But there’s no reason she can’t play like she belongs the rest of the way. Collier was also the Most Outstanding Player of the 2017 Bridgeport Regional. “Having those comparisons is probably unfair, but that’s what you get when you have a great year like she had,” Samuelson said. “People will expect you to do the same thing. But she’s done so many different things this season and has expanded her game to be so good. But when you put up numbers like she did, people expect more of the same. And now she must maintain it. Second-seeded and reigning national champion South Carolina and No. 11 Buffalo meet in Saturday’s first regional semifinal at 11:30 a.m., with UConn and Duke to follow. The Sweet 16 winners meet Monday night for a spot in the Final Four. Posted in New Britain Herald, UConn on Friday, 23 March 2018 20:05. Updated: Friday, 23 March 2018 21:07.